SAN DIEGO, CA. After Monday’s tragic crash of a F/A-18D Hornet into a University City residence that wiped out nearly an entire family and their home, destroying and damaging four other houses, calls have begun to mount for moving the Miramar Marine Corps Air Station. The crash occurred when the pilot, who had lost power in two engines, could no longer control the aircraft and ejected. 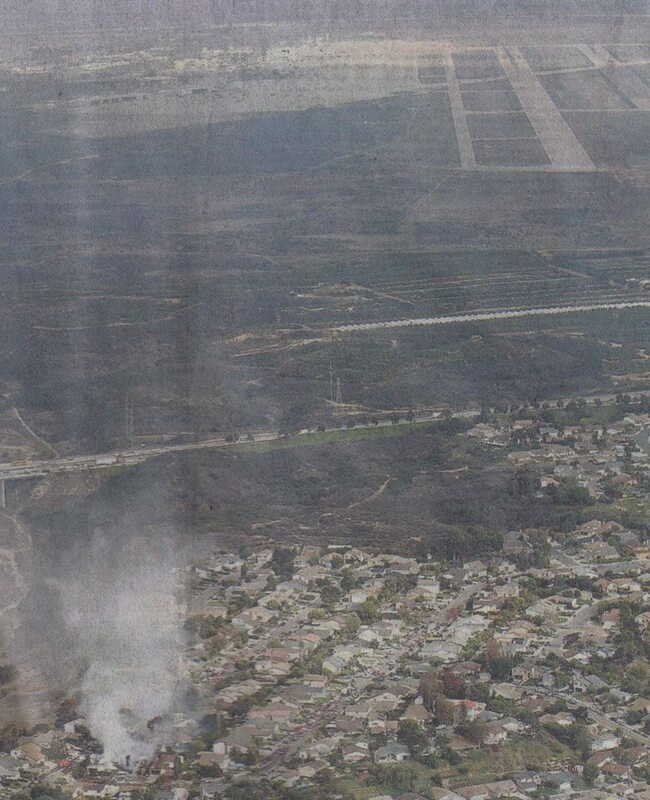 The plane crashed into a residential neighborhood two miles west of the Miramar runway. The plane also narrowly missed University City High School by a quarter of a mile. Don Yoon, who was at work when it occurred, lost his wife, two young daughters, and mother-in-law in the horrific crash. 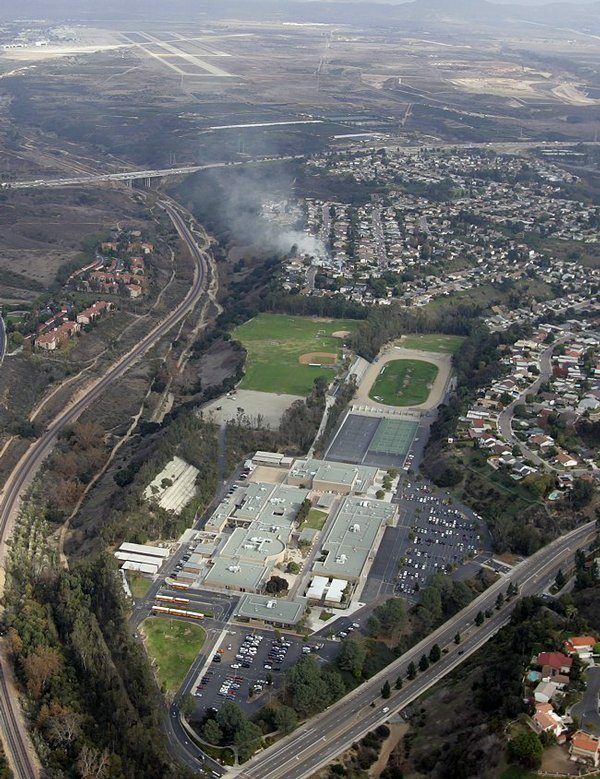 A second letter asked: “What if the aircraft had crashed into the high school?”, and then demanded: “As residents of San Diego, we should call for an immediate halt to all naval flight exercises that send aircraft over our neighborhoods.” Another flatly stated the pilot’s “decision to cross the shore and head over the heavily populated La Jolla and University City areas in a crippled plane was foolish and cost four lives.” Yet, another letter writer said he had campaigned “to get Miramar moved to El Centro or some other remote location, away from civilian populations.” Other letters sounded the same theme, although, not all letters contained that tone. What’s unclear is why the pilot chose to land at Miramar, which involves an approach over heavily populated La Jolla and University City, instead of North Island Naval Air Station, which could be approached entirely over water. In 1979, a defense researcher warned in a report against building the school or houses too close to the end of the Miramar runway. Many residents fought construction of the school for 17 years because of safety and environmental issues, but the school’s backers prevailed, and University City High was opened in 1981. “A substantial threat of a catastrophic accident exists in the community west of Miramar,” said Jerry Kopecek, the study’s author, who was then a vice president for the Navy consultant Science Applications, Inc. …. Kopecek, now retired, said he looked at half a century of data showing that most crashes occurred within two miles of the end of a runway. The voiceofsandiego has an excellent recap of the warnings from 30 years ago. There will be a public forum to discuss issues that the crash raised, hosted by newly-sworn-in City Councilmember Sherri Lightner, Police Chief Lansdowne and military representatives. It will be held at Univeristy City High School, located at 6949 Genesse Avenue at 6pm. Several government investigations on the crash will also be held shortly. so they’re having the hearing at the school that shouldn’t have been built…. That was too close! I’m moving. Apart from activist-fatigue and the holidays, this tragedy shakes my cage. What year was it when the ‘voters’ signaled that Miramar was not going to be the next civilian airport? We must state the obvious. I agree with those letter writers – Miramar military airfield must move. We cannot have such a widely-used runway in the midst of neighborhoods, schools, and shopping centers. Why is it there? History. That whole area was military during WWII. Until it moves, we must call for a suspension of all naval and marine air exercises that involve Miramar. But where will are pilots train and who will protect us if they don’t It was just an axident. Stu, I think the point is there are other alternative airfields for the Marines to train at, and that despite the warnings given 30 years, the “accident” happened. But it was predicted. Why? Because it is simply too dangerous to have schools and residential neighborhoods surrounding a very active military airfield. Period. The military arm of the U.S. govorporation will have its way. The Naval hospital was built in Florida canyon, if you recall that battle. The military expands; it does not contract! The U.S. military has expanded all over the world. Look at the battles in Japan and Korea between the common people & the military. The military will not contract because those in charge of its sphere of influence do not compromise. We on the left have won little or no battles since the black shirts of Bush & Co. cheated their way into the White House. What has happened to the military bases in South America will surely not happen here. More bases will probably be built in Colombia because of its right wing government and the fact, I think, that the Bush family has purchased about a hundred thousand acres of land in Paraguay, right over a giant aquifer. A wonderful development would be, of course, if the U.S. returned the land under Guantanamo to the Cubans; yes, close the base. I think that could happen! Here, watch while I hold my breath. It is always a tragedy when life is lost. My prayers are with the father who lost his family. The City and County of San Diego are not blameless in this incident. This tragic accident could have been prevented. MCAS Miramar has been around in one form or another since the Army first purchased the property in 1917. The fact that local governments allowed development so close to the installation puts them right near the top of the list for blame in my book. Most military installations and civilian airports for that matter are built on the outskirts of populated areas just to prevent this type of tragedy. Yet, as local populations grow near these areas, local governments and developers loose site of the danger and allow growth so near to these installations. Then when a tragedy happens, the people cry out for the military to move its installation. No development should have been allowed near there in the first place. MOve the goddamn thing. Too bad the military has been there since 1917. So what? I’m tired of the military getting their way ON EVERYTHING. can you even think about how much money it would cost to relocate aprox 6 f/a-18 and 8 helo squadrons??? Older Article: A Whitewash for Blackwater?